You can read my earlier Leaf posts here, here, here, and here. The Leaf I ordered is not due to arrive for another two months. Another engineer that I work with called me up (while he was on vacation) to tell me that he had just test driven an orphaned (the ordering party decided not to purchase) Leaf. It was fresh off the truck and had a 12 percent charge. He warned me that the dealership wanted to sell it for $3,000 over MSRP. I called them the next morning and made an offer to pay cash for MSRP, which they accepted without any hesitation (possibly because my colleague had softened them up when he accused them of price gouging). I drove it home that afternoon. 1) My Nissan account (which I can't log into) tells me that my email address is not in its database, although I have an email with a confirmation number from the dealership for the car I ordered. This made me nervous. 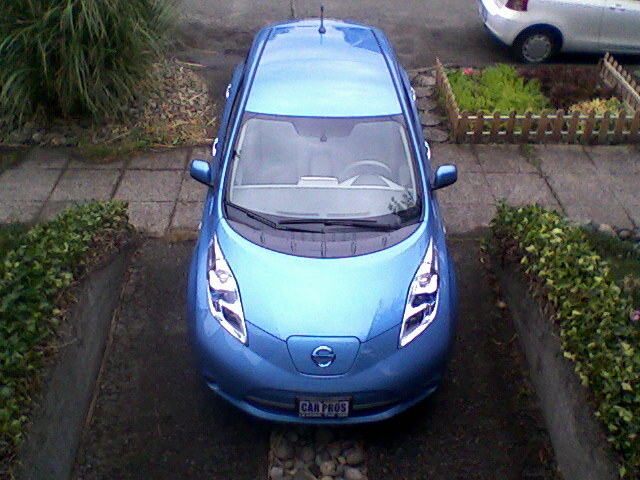 2) I had ordered a black car because a blue one (my preference) would take six weeks longer to arrive. 3) A Leaf in hand is worth two on order. I called ECOtality (the company installing 240V chargers for Nissan) and asked if they could move me up the schedule. They normally wait until two weeks before your delivery date. Some people have gotten the chargers installed for free thanks to a DOE credit but chickened-out when it was time to pay for the $35,000 car when it arrived. I've never heard back from them. Not a problem in the short term. The 120 volt charger that comes with the car has been adequate for my needs to date (about 40 miles per day). I wasn't overly impressed when they inspected my house to see if it would qualify for the DOE credit. The guy showed up in a beater car with no hub caps and pulled a form out of his pocket. His new-hire assistant arrived late in a cab and they didn't leave a card or any other way to contact the company. At least these cars are creating jobs. [UPDATE 7/29/2011) I have electronically signed the waiver form to let the DOE monitor my charger once it is installed. Another email asked for the car VIN to verify that I really have an orphaned Leaf.